With a dysfunctional home life, she spiralled downwards abusing drink and drugs with the inevitable impact on her life and education. "When we got the phone call about my brother, we partly guessed it would happen. He wouldn't have been the greatest in school, he was in trouble with the guards, I just started taking the pot he was taking until I finally came to a stop and said this isn't a life I want for my kids, so I woke up one morning and told myself cop on and do something about it." 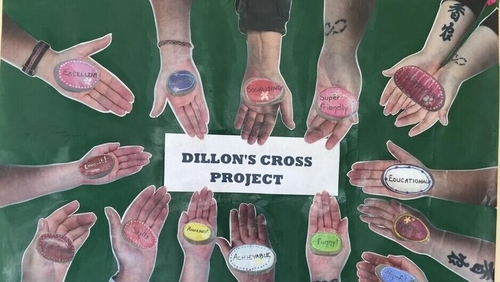 Through the grapevine Jodie heard about the Dillon's Cross Project based at the Glen Resource Centre in Mayfield on Cork's northside. Set up in 1995, the project is an outreach programme of the Education Unit at Cork Prison providing support and education to the wives and partners of prisoners and ex-prisoners. Eibhlín Davitt, who runs the project, says these are women who are often neglected and forgotten about - many of whom have endured a lifetime of serious dysfunction. The project tries to help them overcome the negative impact of having their husband or partner in prison so that they can function for the good of themselves and their children - providing them with a routine, and equipping them with fundamental life skills. "Having to manage the children on your own, you are effectively a lone parent but yet you are married or have a partner in prison. You see him once a week. The partner in prison is in a kind of prison bubble and they can't relate to what is happening at home," says Eibhlín. "I had a woman once who said to me, I have a four-year-old who won't go to bed, and a 14-year-old who won't go to school and I have a partner in prison who can't relate to either of those problems because he has so many problems of his own. It is so difficult for people." Mental ill-health, substance abuse and the reality that their children are at a greater risk of ending up in prison too, are among the many problems facing these women. Edel Cunningham, the Head Teacher at the Education Unit at Cork Prison, which oversees the project says a recent survey of the English prison system found that over 60% of the sons of men who served time will end up in prison themselves. It is in an effort to break this cycle of re-offending that this project offering support and education is so important, she says. The project is acknowledged as a model of good practice, but it "survives on peanuts", according to Edel. Every year, she says, is a struggle to balance the books with funding from the HSE, the Board of Governors at Cork Prison, the Sisters of Mercy, the Drug & Alcohol Task Force and the Educate & Training Board. Edel has no doubt that the project could do an awful lot more if there was money for extra teaching hours and to enable them reach out to other projects, especially those supporting the children. "Really what we are trying to do is prevent the next generation going down the same pathway," she says. Over the past 24 years, Eibhlín says they have helped more than 300 local women to achieve academic success under a programme which has evolved over the years but now offers modules on maths, computers, personal development, sewing and cooking to levels 3 & 4 QQI (Fetac). Next door, the sewing machines hum as students from 24 years of age to 62 work on their end-of-year projects. Among them is the course's youngest student. The 23-year-old tells me she was terrified of the sewing machine when the teacher Mary first sat her down in front of it but now she is flying at it. She proudly shows me the cushion she made with its love hearts and her two sons' initials. Another student has made a sensory blanket for a child with special needs. She is so glad to be doing the course. Everything taught here is practical, she says. It’s good for the self confidence and for the company. "Sometimes people have to let off steam. It’s great for the head and the heart, great for everything, really." Elsewhere in the prefab, Jodie is finishing her morning maths class and will soon be off to collect her children from school. She reflects on the changes the progamme has made to her life and her dreams for the future. "Looking back a few years ago this would never have been me. I didn't really look towards the future, I dwelt in the past but since I started coming in here that's changed." "It’s the best thing I have ever done. "I was talking to the boss this morning about going further to be a youth worker and she said once I've finished the years here they will all help me to go where I want to go." Every success here is hard-earned and celebrated. This year the project celebrated a first - a former student graduating with a Bachelor of Arts degree. Eibhlín said this was monumental for them. But so too was the woman who wrote her name in the roll book for the first time. "That was just such an unbelievably joyous moment, we were literally dancing around the kitchen so that there are all different levels of success but the majority of people who go on to second or lower third level would go on to do hairdressing, child care or nurse's assistant." Over tea and toast in the kitchen at lunch break, 32-year-old Margaret tells me she hopes to study English at UCC, having finished the programme on her second attempt. She's a bit nervous but says she knows there will be support for her here. She is the first person in her family to graduate from a course of any kind. Margaret says her 12-year-old daughter is so proud of her and recalls that following her graduation last January, her little girl took her mum's graduation cap and picture into school on her Show & Tell Day to tell everybody that "her mam graduated and she is going into UCC now and she could be teaching one of us some day". Looking around her as the women pack up for the day, Eibhlín remarks that despite all the angst and all the sad stories, there is a fantastic atmosphere and the girls are full of fun - they get a lot of attention, and they appreciate that.